DR SPACE has made several synthesizer improvisations in the studio over the past few years. These three tracks are multilayer explorations into sound. This is the first of a series of albums to be released. The plan is to invite different guitar players that Dr Space has worked with over the years to contribute to each album in the series. On this one, we have Nicklas from the band ‘Papir’ and Richard Orlando from ‘Alien Planetscapes’. 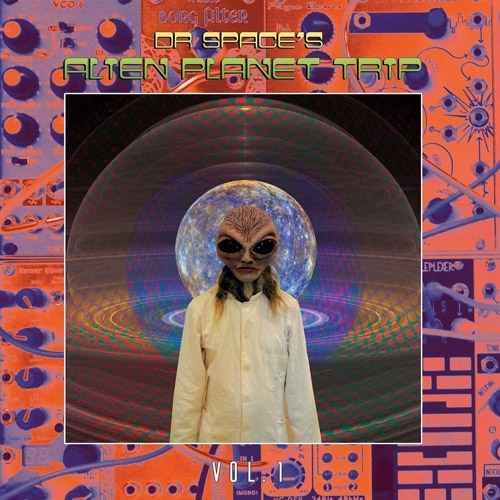 The opening track ‘5 Dimensions Of The Universe’ is made of 5 repeated motifs over which Nicklas recorded different guitar parts and Dr Space used different synthesizers in each of the 5 sections. Later, Richard added some intense guitar and made the mix pretty psychedelic. ‘Rising Sun On Mars’ starts with some monotron feedback and then drifts into the netherworld. ‘In Search of IO’ features a repeated drum track to create the feeling of forward motion. Some very cool guitar on this one. This is not all like ØSC but more like early Tangerine Dream (not as sophisticated), Sounds of a new Soma, Sulatronics, etc... Just Analog synths and some guitars! Pretty psychedelic and spaced out.... Enjoy.. Recorded at the Space Station Studios, Copenhagen, Denmark at various times during 2016.